The charter calls for a range of legislative reforms to improve both workers’ and union rights in the south and north of Ireland. Each progressive change itself is important for workers, but, if achieved en masse, or even a majority, it would be a significant challenge to capital in Ireland and strategically balance power to labour, from capital, contributing significantly to the struggle for socialism in Ireland. Many trade union activists contributed to this charter, directly in writing it and indirectly through ideas, feedback, and discussion. Through meetings over the last three years, ideas have been discussed and challenges made to how we can better organise left union activists. This charter was then drawn up directly by a number of trade unionists and put to the floor at an open public meeting, where it was passed, with one addition made. This democratic process itself is important. We are asking left union activists to sign and share this charter with like-minded trade unionists. We will support trade unionists who put motions forward to policy conferences on these demands. We will lobby for political support for our positions. We will campaign to win for workers and for the movement. This Charter campaign is just a start. It will help us to better co-ordinate a left bloc within the movement. Be part of this. Get involved, and support the Charter. 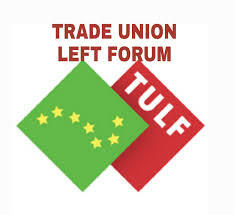 Below is the message we sent to all who signed up to the TULF. We want to show that there is widespread member support across unions for a radical programme of workers’ rights in Ireland. We want to put pressure on unions and political parties to adopt this programme. While each demand itself is inherently winnable with popular support, achieved together it would result in a significant shift in the balance of power in Ireland away from big business and towards working people. Sign the charter and share it. By doing this you are showing public support for the demands in the charter and for a future worth fighting for. Share it with friends and colleagues, and ask them to sign and share it too. Look out for further actions and meetings, and participate as we develop this campaign. The first step is to win support for the charter from trade unionists across the country. We will then step up efforts at lobbying unions and political parties. We hope this charter can also inspire activists to put forward motions to conferences and seek democratic support within their own unions for the whole charter or elements of it.